The interior mantle of a giant clam can be quite striking. (Photo: Wiki Commons). 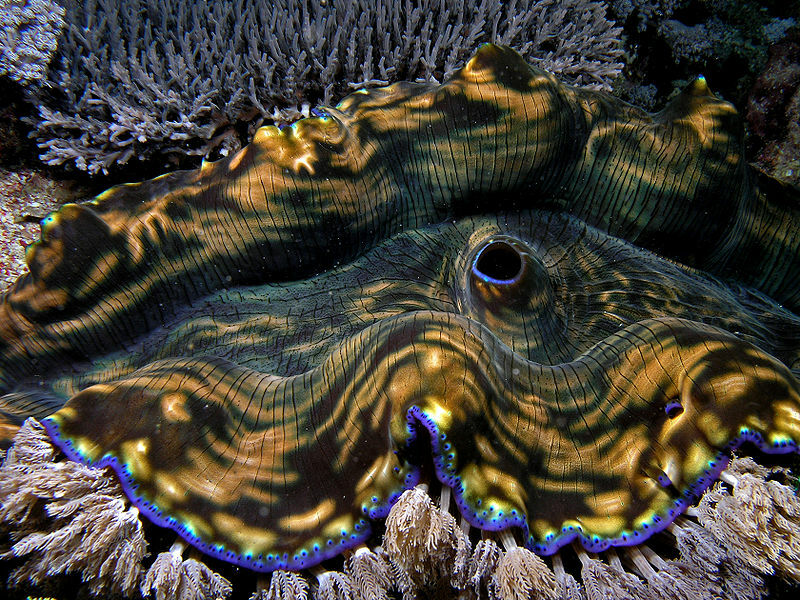 Giant clams (Tridacna gigas) are found in the southern and western Pacific and Indian Oceans. They tend to live in fairly shallow waters, where sunlight can penetrate, usually no more than 20 m (66 ft). It is the world's largest clam and can grow to about 1.3 m in width (4+ ft), and weigh up to 227 kg (500 lbs)! Giant clam shells are bivalves, with two halves. Inside the two halves is a fleshy mantle, or fold of skin that secretes calcium carbonate and builds the shell of the animal. During the day the clam opens its two shells and the mantle spreads across the opening of the two halves. 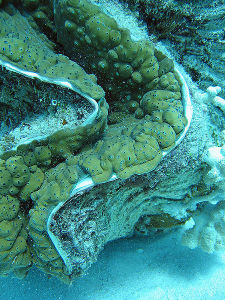 The giant clam feeds using two siphons (tube-like appendages). One draws in water and the other spits out the water (slurp and spit method). The water that flows through the clam carries food (in the form of plankton) and oxygen into the clam. The clam expels waste by ejecting it through the "out" siphon. They have motion-sensing tissues and can detect water movement, so they can close if a predator is nearby, but it's a myth that they can close on a person's hand or foot. They don't open that wide! The outer edge of a giant clam shell's mantle (Photo: Wiki Commons). Now here's the neat thing about giant clams, they are living greenhouses (with built in mirrors), which is in part why they don't live at deep depths. Giant clams are living in a symbiotic relationship with zooxanthellae (big word meaning little single-celled wee beasties, namely algae) in their skin. The clam can get as big as it does because of the nutrients that the algae provide, and the algae benefit by the clam's protection and greenhouse-like shelter. 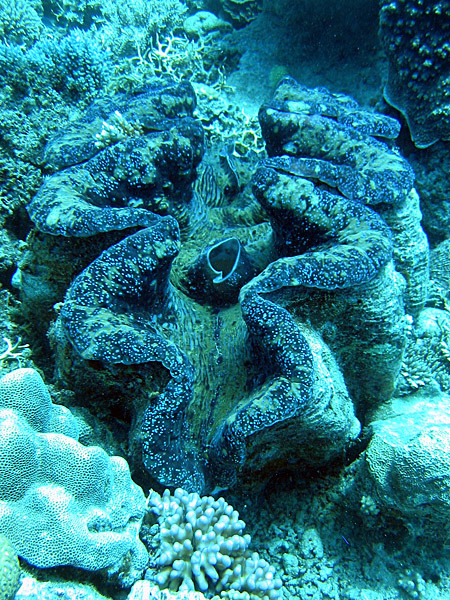 Here you can clearly see the pigmentation of the outside and inside of the giant clam, as well as one of its two siphons (Photo: Wiki Commons). So where do the built in mirrors come in? 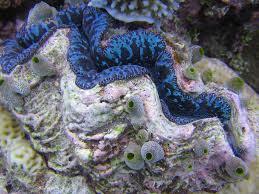 If you look at the outer mantle of a giant clam, it appears to be many different colors, even iridescent. This is because of pigment cells called chromatophores (like what cuttlefish and octopuses have). These cells can change colors from blue and white to silver. They are particularly present around the edges or lips of the clam. The giant clam also has a specialized type of chromatophore called iridophores (when they're clumped together they're called iridocytes). Iridocytes are formed in stacks, or columns, of cells with a uniform thickness. These iridoyctes sit in stacks at the top of columns of algae cells. The algae need to be in columns, because if they weren't they could be burned by the sun's UV rays, and not photosynthesize efficiently. The columns of iridocytes and algae are separated by cytoplasm, and they form a unique lattice pattern inside the top mantle of the giant clam. The iridocyte plates at the top are light reflectors that both "interfere" with the wavelengths of visible light and focus them. Check out this video from EurekaAlert to see a 3D model of the giant clam's iridocytes and algal cells. The iridocytes do not magnify light, which would cause sunburn to their algae cells (they don't want to sunburn the lunch lady). Instead the iridocytes scatter wavelengths of visible light in a cone-shaped pattern. The more useful wave lengths are spread the widest (near the widest part of the cone, which also extends the deepest). These are the red and blue wave lengths that algae like best to use for photosynthesis, and which hit the sides of the pillars/algae. The other wave lengths of the light spectrum are narrowed (near the top of the light cone) and refracted so that they don't harm the algal cells. The iridocytes form beautiful iridescent colors on the mantle of the clam (Photo: Phil Camill, Flicker sharing). So what's the big deal with all this stacking and refracting? Not only is it pretty cool, it also has implications for how humans might use biomimicry (mimicking nature to solve a problem) to create efficient algal fuel cells for alternative energy. If we can figure out how to mimic the giant clam, and it's complex mantle structure, we might be able to solve the problem of making efficient, high energy fuel cells using algae and sunlight. Giant clams could help humans make giant strides in understanding how they use algae to their mutualistic benefit, and possibly ours. Posted in Biomimicry, Invertebrates and tagged Giant clam; giant clams; iridocytes; on January 13, 2015 by Infinite Spider.